First off, if your scungy feet are epidermal barnacles, capable of remaining afloat in a canoe of calluses and dead skin, you are probably looking for help with exfoliation and not defoliation -- that is, unless your feet are in such bad shape that they are also nurturing plant life between your toes. Listerine does contain chemicals that can kill bacteria, but that won't directly impact your dead skin cells. Besides, your breath is awful today, and you would be better served by using that listerine in your mouth. (If you were actually interested in defoliation, there are several broad leaf herbicides that I can recommend). I'm presuming that the searcher mistyped "hemi-cow", which is like a hemi-cat, but favouring the opposite yoga position. 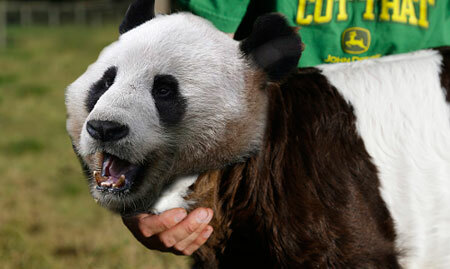 Although the cow in the photo below does look like a panda bear, there is no proof that it's real, so don't be bamboo-zled. 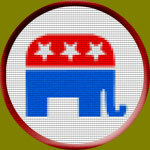 is there a republican merit badge? Develop a plan to create the smallest possible, yet functional, federal government that can support the current US population of 313 million people. With the help of your city hall's past voting records, redraw the voting districts in your state to ensure maximum Republican electability. Through family interviews, construct a family tree at least three generations deep. Circle any female, homosexual, or minority relatives in red and justify them. Contact a Green Party or Libertarian Party candidate in your region and trick him or her into thinking that your vote (or your parents' votes, if you are under 18) is guaranteed.